..is what I'm after. Who's great enough to find one? It's getting a little old. A, S, N, L and E keys are blank. D, W, C and cursor keys are almost there. Some of the left-most keys are getting sticky enough to not work once in a blue moon. Lastly, one of the rubber feet has come loose and things are getting bad. I want something which will improve my typing speed. I want plenty of media/programmable keys (I tend to launch up to six websites from my keys at present). Preferably with backlit option, but this is optional. Not interested in gaming keyboards, but will consider one if it satisfies the three main criteria. Budget of £50 ideally. Might stretch to £80. The current mouse is pretty good most of the time. Occasionally hard to get onto that specific pixel in a large image in Paint. It's a laser cordless and it's on the desk (which is slightly textured and laminated). I use the scroll wheel with the soft clicks, and also the scroll left and right click of the wheel. I use the forward and back buttons inside the thumb. I generally don't use the top button (to the left of the wheel), or the button under the thumb, but I might in future. Total budget of £100 including the keyboard...maybe £120 at a massive push. I wonder if I might better at going for pretty much the same/similar mouse again, and avoid the productivity drop. For the mouse - look at the Performance MX. I have been using one for two or three years and it is great. 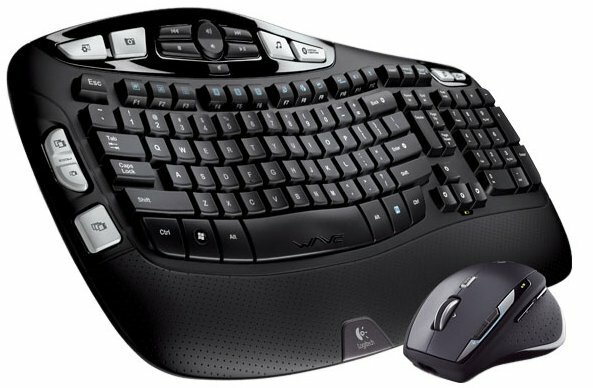 Have ordered another for the new PC too - along with a K800 keyboard. A bit on the expensive side, but a possible option. Keyboards are a nightmare. Different layouts for a start. I've gotten used to Logitech's layout. It seems that to get a decent (keys that travel properly and are good for typing) keyboard nowadays, with all the add-ons, you have to spend £120 or more which is completely unreal. Are we seeing the impact of mobile devices on the PC peripheral market, or are the parts just more expensive? Mine was a bundle price direct from Logitech (Digital River doing the selling) and was £139 for keyboard and mouse. So far the keyboard, which only arrived a couple of hours ago feels good. Decent weight, nano-receiver that manages mouse and keyboard interface, keys with good travel and positive feel ... and it is backlit when it detects a hand close by. My favourite too! Had one that recharges on a stand overnight, and now one with the plug in charging cord. I also bought a spare when I saw some on special offer a few months ago! My first one developed a fault after a year, but Logitech replaced it with no hassle. I've used a number of Keysonic keyboards - I like the keystrokes and they're quiet. My last two have been slimline ones with an aluminium top plate - the 8020 was lovely but the 8021 which I have now has no adjustble height at the back (had to make some rubber feet!). The 'L' is just about gone now, and half the 'N' after 8 months use. Another I liked was a Saitek my son gave me a few years back. My never ending quest is another nice touch quiet one but with letters that don't disappear off the keys! Best keyboard I found for feel was a cheap one from PC World which was a Logik Multimedia wired one but they seem to have dropped it now. Logitechs always feel spongy to me. Well I've gone for this keyboard and the mouse you suggested. If it's a naff mouse, it's your fault. I picked that keyboard, as it has 18 'macro keys' (54 settings apparently) and is mechanical. Sadly it's not wireless, but at least I won't worry about batteries for it. Both from Amazon for a total of about £130, so almost within budget. Keyboard looks good - built with Cherry keys which is always a good sign. The keyboard is pretty good. Bit of a review. Typing is far, far better, although my own speeds are generally 30-40 wpm anyway, and the new kit will take a few days to get up to speed. Logitech's layout is different, so things like the delete, home and end keys are slowing me down, but certainly far better. To be honest the old keyboard was getting to the point that I might type a sentence then find that a word or two was missing. The batteries were cutting out or something. That or the wireless aspect, although the mouse is fine. Brushed metal, with backlit keys, although not that important to me...but it's growing on me. G1 - G18 keys. I have setup top twelve websites and the top six apps. Far faster for productivity. There's a palm/wrist rest, and it clicks into place then is secured by a screw at either end. One of the screws was missing, so a little miffed about that, although, I can't see how it will affect the setup. Zero screws and it would require pressure to pop out of place. Cable - Quite thick. Braided material. Fine. Two USB cables emanating from the other end. One for keyboard; one for pass through so you can connect a USB device to the keyboard, such as headphones. I use headphones rarely, so will most likely use it for the USB mouse receiver thingy. The mouse prior to the current one had problems communicating through the desk to the back of the PC, so I rigged up a three meter cable (for tidy route through kit) and popped the receiver to the base of the monitor, and have done likewise with the current one. However, the cables on the new keyboard are two meter and I need two extension cables, so if it's a 'Con' I would have preferred three meter cables, but that's probably me being fussy. The volume control is a spinny wheel effort, which looks and feels great, but there's no visual volume on-screen as there was with the Logitech. No way of knowing the volume until you try it out. G Keys - Config for websites is either beyond me on the normal method or is not an option. For example, to configure for an app, I just select an option "Launch Program", pop in the path, such as "%SystemRoot%\system32\mspaint.exe" for MS Paint, and it's assigned. There's no obvious way to do that other than to launch the default webpage in a new window (each click launches a new window; not a new tab!). So here's the solution...create a batchfile to call the path. Create a .vbs file to call the batchfile (which gets rid of a popup command window), then get the keyboard config to call the .vbs file. Slightly slower at launching, especially if it's a new window. By slightly I mean half a second instead of instant. Subsequent tabs are pretty much instant. All a bit complicated, but once setup it's pretty nice. So...typos for a week (I must have made 20-30 edits on this post), and if I can get Corsair to pop out a replacement screw, and get the new mouse to work via the passthrough...an Excellent piece of kit...and at £90+ so it damn well should be! Piccy 14 - Panned back for view of keyboard and much nicer things. You're welcome. Nearly forgot - Back feet open from middle to end, which is good if you move your keyboard forwards and backwards at all (prevent feet closing I suppose), although there might be a slight chance of scratching the desktop as they are moulded plastic. We'll see. They definitely missed a trick there, by not rubber-ending the extending feet. There's not that much difference between it and my current/old mouse. Very similar button layout. Very similar shape. Easier if I show some pics and describe the setup. Pics of the box.....inside the box...back of the box. Note the strong magnet on the edge of the box. Box Contents laid out. Mouse, receiver, dox (no disc), and pencil case. Contents of the pencil case. UK plug fitting, power unit, power cable, and receiver extension cable (bottom). The end of the receiver extension cable. At first I thought this meant "only plug in the receiver". Apparently not; will explain later. The two mice, old and new. Button layout of the two mice. Different, but not massively so. Under side of the two mice. Note that the IR sensor has moved to the middle of the new mouse. Better or just different? The old and new receivers (new on the right, in case you weren't sure). 2005 - Logitech mouse and keyboard. Both, but especially the mouse was inclined to lose signal. Fixed it by running a USB extension to top of desk, within half a meter of the devices. To get either to connect, one had to press a tiny button with a pen point. Very annoying. 2009 - New Logitech mouse and kb. Same setup, so never tested USB receiver until last night. Now my new kb has two USB fittings. One for the kb and one for 'pass through' for another device. However, my setup requires extension cables and I had just the one. Then I notice the extension supplied with the new mouse. Obviously Logitech have cottoned on to the receiver issues, which is at least providing a solution for those with such issues. The sticker on the port (pic 7) is better explained in the instructions. Basically it's there to explain that users should not plug said cable into the powering cable (i.e. it's not a power cable extension). On that basis I figured it would work with the pass through...and it did. Great! Compared to the 2005 setup with pen point buttons, setup was terrific. I popped the batteries for the pics and popped them back and the old mouse just carried on as before. Popped the receiver for the pic, and replaced. Again, the old mouse worked within a split second of plugging back in. Popped the old receiver; switched off the old mouse. Hooked up the pass through and plugged the new receiver into the kb; switched on the new mouse. 5-10 seconds of 'installing new software' and it's all up and running. Wonderful! Receiver in the keyboard - a sensible setup, with less cabling to the desktop. The only real difference is the new mouse button layout (pic 9). Where my thumb expects the back button to be is now the zoom button. Five minutes of this and I had to change things. I generally don't use the forward button as often and rarely the zoom at all. So I've configured the zoom as back, the back as forward, and forward as zoom. Got that? So that's it. Take away all the piccy time, and setup was about a minute. New mouse has hooked into the old config software, so nothing to install either. Oh, and since I won't be using any of this in a mobile sense, I have a free pencil case.